It’s finally here! Hewitt Trade Services are now offering 36 months, no deposit, 0% interest free finance* on selected Daikin ducted air conditioning packages. 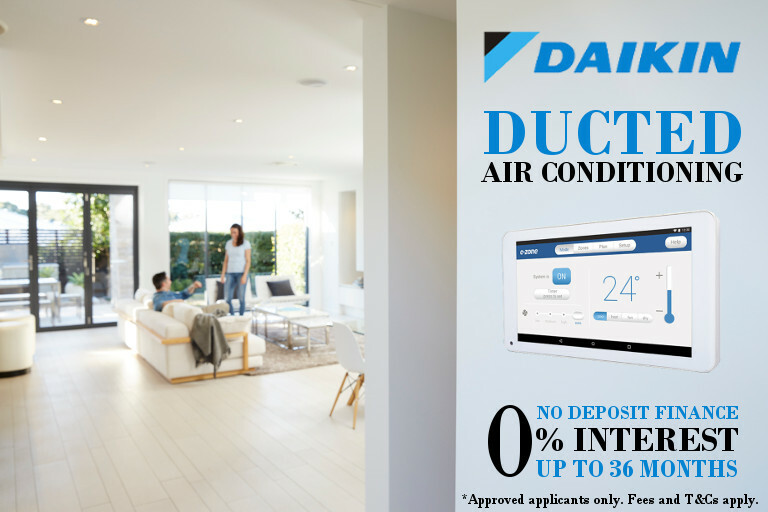 If you’ve been thinking of getting ducted air conditioning for your home, then you’d be crazy not to take advantage of this Daikin ducted finance offer. Simply get one of our selected Daikin ducted air conditioning packages supplied and installed and pay it off with fixed equal repayments over 36 months. 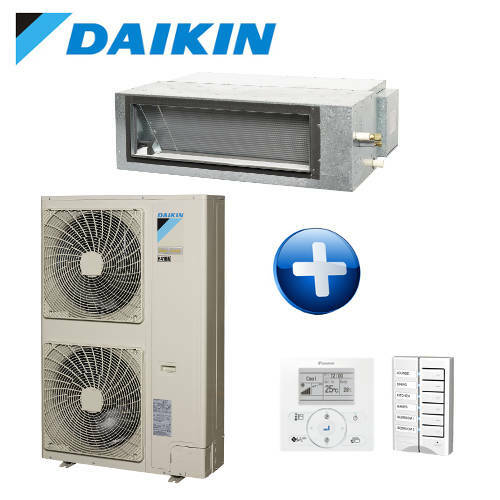 Book a free quote today and have your Daikin ducted system installed within a week! Better still, almost all installations are completed in a single day, so there’s no major inconvenience to your day to day life. You can get a Daikin ducted inverter installed on a budget thanks to Advantage Air’s PZK zone control system. The PZK system still delivers great performance and quality, but at a more economical price point. Check out our Basic PZK package deals below! Get a Daikin ducted inverter installed with an Advantage Air e-Zone zone control system for the ultimate ducted air conditioning experience. We have unbeatable Deluxe e-Zone package deals available, check them out below! Call or email us to book your free quote for a Daikin Ducted Air Conditioning Finance Package. Apply online in minutes (you’ll need to be over 18, a permanent Australian resident and earning over $25,000 full time). Contact us (Hewitt Trade Services) to organise your purchase for you. To authorise your purchase, you’ll need to enter the second 4 digit code SMSed to you. Enjoy your purchase! You’ll receive a welcome pack with your card within 10 days and monthly statements showing the fixed repayment amount and due date. We're Brisbane's Favourite Daikin Dealer! HOW TO KNOW IF IT’S TIME? There’s no denying that having an air conditioner makes life so much more comfortable when you’re battling the harsh Australian climate. However, there comes a time when your trusty old air conditioner just doesn’t perform as well as it once did. Excessive noise, costly repairs, unusually high energy costs, and uneven cooling/heating are some signs that your air conditioning unit might be on the way out. When you replace your old Daikin ducted system with Daikin’s premium inverter ducted system, you can save up to 25% on running costs, watch to find out how. Daikin are a large and diverse team of qualified professionals dedicated to product development, innovation and exceptional service. Founded in 1969, Daikin Australia has been providing air conditioned comfort for homes, commercial developments and community projects across Australia for over 40 years. Follow them through the years to see how they’ve become not only Australia’s number 1, but also the global number 1 air conditioning brand. *Approved Skye Mastercard applicants only. Fees, terms, conditions & minimum finance amount $1,100 apply, incl $99 Annual Fee charged on the account open date and annually on the anniversary of that date. Annual Fee must be paid in full within 90 days or it will attract interest. 90 days Interest Free and no repayments available on all Skye Mastercard purchases (excluding cash withdrawals). Standard Card Purchase Rate applies to any outstanding balance after the 90 day Interest Free and no repayment period. Minimum monthly repayment may be required. Total amount payable by 36 equal monthly installments. If you fail to pay a fixed monthly installment, interest, (charged at the Expired Promotional Rate) is payable on that outstanding amount. See skyecard.com.au for current interest rates. Only available at Skye retail partners. Credit provided by FlexiCards Australia Pty Ltd ABN 31 099 651 877 Australian Credit Licence number 247415. FlexiCards Australia is a subsidiary of FlexiGroup Limited. These prices are based on a standard ducted installation. A standard installation consists of R1.0 ductwork, Purtech return air grille, plenums, electrical circuit including safety switch & isolator and circular outlets. Installs that are not standard may include things such as limited roof space, crane hire, asbestos ceilings, non-standard outlets and any other special job or site requirements. All pricing advertised is subject to a site inspection. If you have any questions regarding what is or isn’t included in our pricing, please feel free to contact our office on 07 3634 0200.